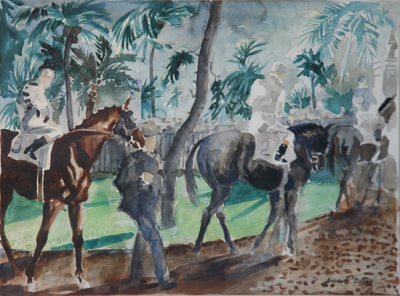 Randall Davey, Hialeah Paddock, Circa 1950, Watercolor, 16" x 22"
Randall Davey was born in East Orange, New Jersey in 1887. From an inauspicious childhood in a middle-class family, he would go on to become a highly-influential early 20th century painter of still lifes, horse-racing and polo scenes, nudes and landscapes. Davey's transformation from suburban child to noted artist began when he went to Cornell University to study architecture in 1905. Though he would not finish his degree, it nonetheless gave him a notion of aesthetic principles and form that would prove valuable later in life. Against the wishes of his father , Davey left Cornell in 1908 and moved to New York in order to pursue a career in art. Davey entered the New York School of Art, where he was fortuitous enough to take instruction from Robert Henri, an art academic who taught many of the Ashcan School and Taos Society artists, as well as being himself a member of both communities. Henri and Davey forged a strong friendship that was not compromised when Henri left to start his own art school the following year and Davey did not follow, choosing instead to study under Charles W. Hawthorne. Soon, Hawthorne left, as well, in order to join Henri at the new institution, and Devey was reunited with him. In 1910, Davey exhibited work alongside such artists as George Bellows and Stuart Davis. He became an accepted member of this small community of artists, traveling with Henri to Europe, Maine, Spain and San Francisco. He became Henri's assistant instructor and, in 1913, took part in the Armory Show, which forever changed the face of American art. His career accelerated after the Armory show and, in 1915, he won the National Academy of Design's Hallgarten Prize, as well as an honorable mention at the San Francisco Panama-Pacific Exposition. Deeply opposed to American entry in the First World War, Davey spent 1917 in Cuba, avoiding the draft. Once he returned to New York, his career faltered. He exhibited only two paintings in 1919, winning no awards. That same year, Davey persuaded John Sloan to travel with him to Santa Fe, NM. Once in Santa Fe, Davey and his wife knew that were not leaving. He purchased an unused mill on the edge of town and converted it to a studio and, the next year, he and his wife moved permanently. While Davey maintained a home in Santa Fe until his death, he took a number of prestigious teaching positions over the years, including at the Broadmoor Art Academy, the Chicago Institute of Art, the Kansas City Art Institute and School of Design and the University of New Mexico. In 1938, he was elected into the National Academy of Design and in 1939 juried a show at the Corcoran Gallery of Art in Washington, D.C. Though he chose to be an artist, Davey's tastes ran rich for such a famously meager-paying profession. He was an avid polo player, and his teaching salary was as high as twice that of other teachers because of the necessity of boarding and maintaining a string of polo ponies. Polo was one of his favorite subjects, as well, and he painted marvelous scenes of polo matches and those who attended them. He was an early driver of automobiles, as well; he and Sloan had reached Santa Fe by automobile, long before they became a commonplace sight. Ironically and tragically, it was a car that separated him from Santa Fe and his art, as he died in a car accident in 1964 on his way to California. He was 77 years old.